The race is about to start. Six jockeys, four of them Latinos, gallop to the starting post in the humid, cold afternoon. In a small room in the upper floors of Aqueduct race track in Queens, with beige carpets and dated wood paneling, Luis Grandison grabs his binoculars. He turns to the glass window next to his desk then reaches for a button. The window opens up and a chilling wind floods the room. The race starts. For the last four years Grandison, 61, has been the only full-time Spanish language race narrator in the country, and one of the first ones to spot an unseen market for horse races in the Latino community. Grandison has helped integrate a new community with an industry that has been losing fans since the mid-20th century, by calling the races in the language they are most familiar with. He honed his Spanish-language race calling skills for 40 years in his native Panama. "Atrás Mascarello (he pronounces Muhz-Kuh-DE-Roh), viene avanzando," Grandison says, motioning his arms up and down, still holding the binoculars on his right hand and the piece of paper with the race details on his left. Mascarello rapidly approaches the finish line from behind. “Fox Rules (he pronounces Pho Roo), dos cuerpos. Mascarello avienta.” Grandison yells into his headpiece while Fox Rules accelerates by two body lengths in the final trench. Luis Grandison on the job at Aqueduct. “Fox rules medio cuerpo, Mascarello avienta.” By now, the rapid speed of Grandison’s words doesn't give him time to breathe in. “Fox Rules! Se entra Mascarello, tercero Wicket Freud,” he says, bouncing up and down, announcing that Fox Rules won the race. His whole body now punctuates each word. He takes a step back. Grandison reaches for the button again to close the glass window and the room quiets down. 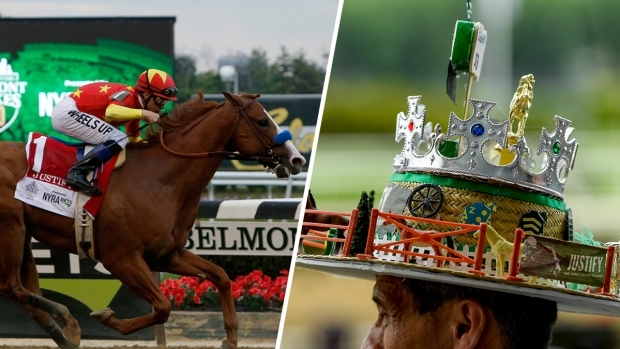 Weeks later Grandison would narrate the Belmont Stakes, where there was added drama this year. 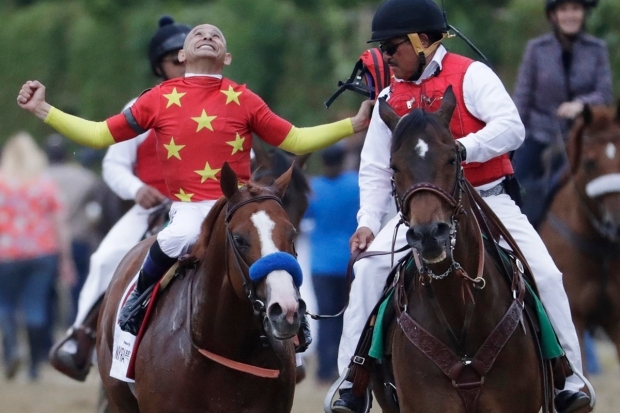 Justify became just the 13th horse since 1919 to win the elusive Triple Crown with a victory on June 9. When Grandison first approached the New York Racing Association in 2013, he was tasked with interviewing in Spanish growing jockey stars hailing from Latin America, like Puerto Rican brothers Jose and Irad Ortiz. Soon after he grabbed the microphone to call their races. These days he narrates horse races at New York’s Aqueduct, Saratoga Race Course and Belmont Park. At Belmont Park, Leonardo Parra, from Chile, has been working as a groom for over eight years at the stables. Other race tracks have followed his lead. Santa Anita Park in Southern California has seen the impact of Latino outreach. The horse track draws in close to a million spectators a year, 40 percent of which they estimate to be Hispanic. For Santa Anita, the interest to bring in Latino crowds has led to weekly events like lucha libre shows, Latin music festivals, tacos and cervezas night, and even something call a “Michelada Rumble,” all of which specifically targets the Mexican audience from the area. The moves are aimed at having Latinos inject money into an industry that has been in decay since 1985, when four percent of Americans listed horse racing as their favorite sport. According to a Harris Poll of 2013, the number dropped to one percent. The cultural connection to horses among many Latinos could help extend the life of the $25 billion industry, which faces competition from other ways to wager. According to Equibase’s year-end report published on January 2018, wagering added up to $10.9 million in the United States, which is a 1.59 percent increase from 2016. The peak was $15.2 billion in 2003. “In the old days, racing was almost a monopoly, if you wanted to bet, you had to go to races," George Ortuzar, a former entertainment anchor for Univison who runs a weekly radio show in Spanish for Santa Anita, said. He said Grandison’s success engaging new audiences has opened the door for other tracks to add Spanish race callers as well. The industry needs "new blood to come into the racing world, and part of that is the Hispanic market,” he said. At Santa Anita Ortuzar has encouraged new fans to get familiar with the betting system by creating tip sheets in Spanish. In recent years, Latinos have been fueling the horse racing industry; working the back and front end of the races. At Belmont Park, Leonardo Parra, from Chile, has been working as a groom for over eight years at the stables. He says most of his coworkers are Latinos, noting how much colleagues from countries like Panama, Venezuela, Mexico and Chile love horses. “It’s all about having love for the horses, that’s it,” Parra said of what it takes to be a good groom. Most of the workers live in residential buildings year round to maintain the Belmont Park’s stables, he said. Former jockey and NYRA analyst Richard Migliore talked about the role of bringing in Grandison in a 2016 post on NYRA website. “In the United States, they are starting to notice that English is the first language, but Spanish is the runner up,” Grandison said.